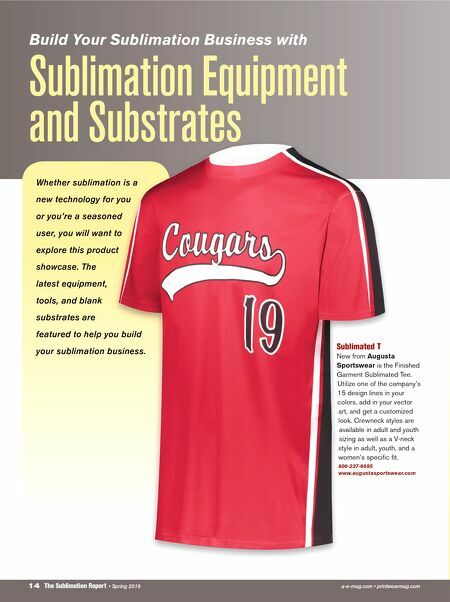 14 The Sublimation Report • Spring 2019 a-e-mag.com • printwearmag.com Sublimation Equipment and Substrates Sublimated T New from Augusta Sportswear is the Finished Garment Sublimated Tee. Utilize one of the company's 15 design lines in your colors, add in your vector art, and get a customized look. Crewneck styles are available in adult and youth sizing as well as a V-neck style in adult, youth, and a women's specific fit. 800-237-6695 www.augustasportswear.com Build Your Sublimation Business with Whether sublimation is a new technology for you or you're a seasoned user, you will want to explore this product showcase. 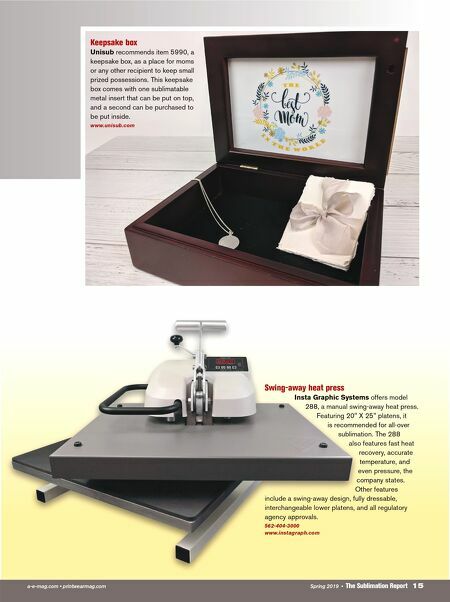 The latest equipment, tools, and blank substrates are featured to help you build your sublimation business.